No matter how you cut it, the link between our feet and skis is a critical factor in not only how we perform, but also how we enjoy ourselves. With today’s technological advances, the mantra coming from the manufacturers remains: comfort and performance don’t have to be at opposite ends of the spectrum. K2 optimizes its award-winning Pinnacle Freeride Collection this season by offering a new Vibram ISO 9523 rubber touring sole (sold separately) to give skiers added grip, traction and flexibility for climbing technical terrain—or the stairs after a sporty après ski. The all-mountain crowd also benefits as K2 expands its offerings: the SpYre 110 is now available in a 97 and 100mm last, while the SpYre 100 comes in a 100 and 102mm last. Dalbello offers its seven-boot, 100mm-lasted Avanti IF (Instant Fit) collection for men and women this season. The series, which ranges from 130-75 flexes, gets its Instant Fit moniker from its progressive density thermo-mouldable liners. The shell benefits from triple-injected 3D Powerframe Architecture. Because of this, the boot retains the classic, solid overlap design while optimizing wrapping and step-in and -out comfort. Underfoot, a grippy, high-traction sole will ensure your wipeouts are onhill-only. Novice, intermediate and lighter skiers looking for extra real estate can try Fischer’s Cruzar lineup (at 70, 80, 90 and 100 flexes in men’s and women’s models). Boasting some of the largest fits in the industry—103mm-plus lasts—these boots also offer a higher instep, higher toebox and lower cuff. Inside the shell expect the brand’s Power Comfort Liners with seamless tongues. The Cruzar 10 (100 flex) offers the greatest girth of them all—a 103-110mm last—and comes with proprietary Vacu-plast shell material for optimal fitting. Alpina calls the four-buckle Elite 130 its all-day, all-weather, all-mountain solution. The comfort-forward boot comes with an InTemp integrated heating system, offering up to six hours of non-stop power from a rechargeable, in-the-liner battery (no more bulky, after-market external battery packs), making it easy to stay warm no matter the weather. A simple, pole-activated ski and walk mode effectively ends bending down to change modes. X-Frame construction provides a sturdy yet light shell, while a pair of footboards enables out-of-the-box volume customization in the 102mm-lasted boot. The Elite’s 4Dry liner enables dry feet through a moisture-wicking, one-way membrane. Magnesium buckles, rubber soles and an adjustable canting system complete the package. How do you take the lightest ski (the frontside-focused Delight) on the market and make it a step lighter? Pair it with the lightest boot! Elan introduces its ladies’ three-buckle Delight (65-flex) in two colour options: white to match its award-winning Delight ski, and black to combine with its Black Magic ski. Besides the weight savings, the moisture-wicking liner offers the benefit of an in-the-liner battery, powering as many as six hours of warm toes (the heater is atop your toes in the liner where your feet’s heat sensors are). Even better, the “plug and play” integrated system means there’s no more unsightly (and awkward) external battery, making for a leaner (that means you can put your pants over your boot to stop snow entering) and cleaner-looking boot. The integrated heater comes in a men’s version, too, with the intended result: warm, comfortable and light boots. Tecnica backs up the success of last season’s boot IPO with the launch of its four-buckle Mach1 130 LV (Low Volume: 98mm last) and the Mach1 130 MV (Medium Volume: 100mm last). The two build off of Custom Adaptive Shape technology that the company says results in the highest level of customization in the market. While Tecnica claims to have the most anatomically shaped liner and shell, C.A.S material allows extra precision fit since it can be heated, grinded and punched, and is found in the critical fit areas of the liner, footboard and shell. The technology is easy to spot: small, golf ball-like dimples allow heat to penetrate more quickly, making it easier, faster and more precise to heat the material. Scott offers a complete backcountry setup from head to toe. This season it employs all of the industry hallmarks to create a “super” boot. As the name suggests, the 103.5mm-lasted, 125-flex Superguide Carbon comes with a lightweight carbon inlay in the shell, Gore-Tex breatheability in the liner, Dynafit-certified tech inserts and bi-density Vibram soles. The four-buckle boot (the top doubles as a power strap) has 60 degrees of movement in hike mode, and weighs 1,415g. Nordica unveils the newest incarnation of its award-winning on-slope series. The Dobermann GP (which comes in 90-130 flexes) features a 98mm mono-injected polyurethane performance shell design, new buckles, an intuitive easy-entry instep, an adjustable Full Motion Pivot alignment system, an improved weatherproof gusset in the toebox and a customizable, 60mm-wide Power Driver Strap. The two top versions also offer the brand’s innovative cork liner. Those looking for an all-mountain version can turn to the GPX (which comes in 100-130 flexes, and 85-105 flexes in a women’s-specific version). Built off the Dobermann mould, these feature quality Primaloft insulation—unique in the industry—and dual-density PU soles designed to keep your feet warmer while enhancing traction. Atomic looks to have every foot covered by growing its bi-injected Hawks line. This year it adds on the Magna, a wider-lasted (now in 102mm) boot over last year’s 2.0 (100mm). With a comfy out-of-the-box fit and easier step-in, the Magna picks up all the hallmarks of Atomic’s most popular all-mountain, four-buckle boots: the Memory Fit heat-mouldable custom shell pairs with a 3M Thinsulate Memory Fit liner, and Power Shift on the shell enables you to change the flex up and down 10 points and adjust forward lean from 13 to 17 degrees. Grippy soles underfoot make for better walkability. The Magnas come in 80-130 flexes across the men’s and women’s range. Working with its top freeskiing athletes, such as Swedes Jesper Tjäder and Jon Olsson, Head introduces the 98mm-lasted Hammer 130 and 110 (freeride) and Thrasher 100 and 80 (park and pipe) boots. The brand-new, naturally flexing, open-throat, mono-injected Triad Ergoflex Shell allows for customization via an interchangeable tongue (included with the Hammer 130). Those landing big air—either front or switch—can expect 360-degree cushioning, thanks to its shock bumper hinge, an inner-boot tongue with shin-saver gel and new shock-absorbing toebox material (on the Thrasher models). Ergo Stance and the Ergoflex Hinge Position translate to a 16-degree forward lean for a balanced position and a four-degree ramp angle for centred weight distribution. Where the boots differ is in their closure points: the Thrasher is a two-buckle with an elasticized band as a third closure point for give on park landings, while the Hammer comes with three-buckles. The Hammer also gets a grippy, rubberized sole. 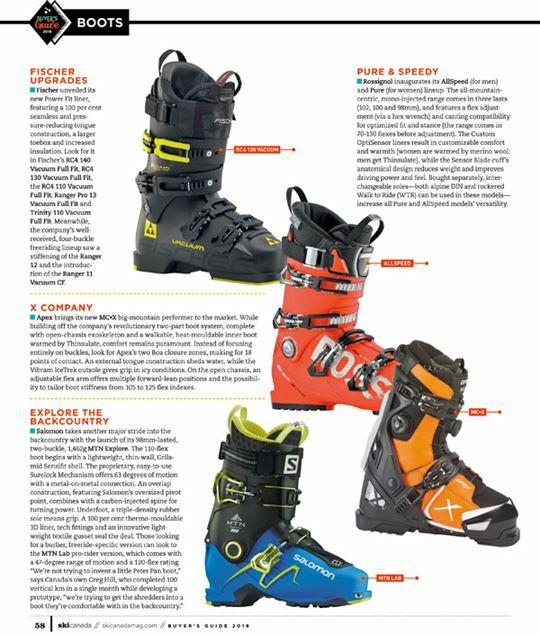 Lange ups the offer in high-performance, four-buckle freeride boots by featuring the XT, a mono-injected construction that combines the company’s storied downhill power with improved walkability. The XT comes in two lasts—low volume 97 and 100mm—and features the next-generation Ski/Hike System 2.0, a new metal-on-metal locking mechanism with a wider V-Lock for increased range-of-motion. Walk to Ride rocker soles combine with the lightweight shell for improved tourability, while liner engineering results in a better out-of-the-box fit. Men can ride the XT130, while women get the XT110. 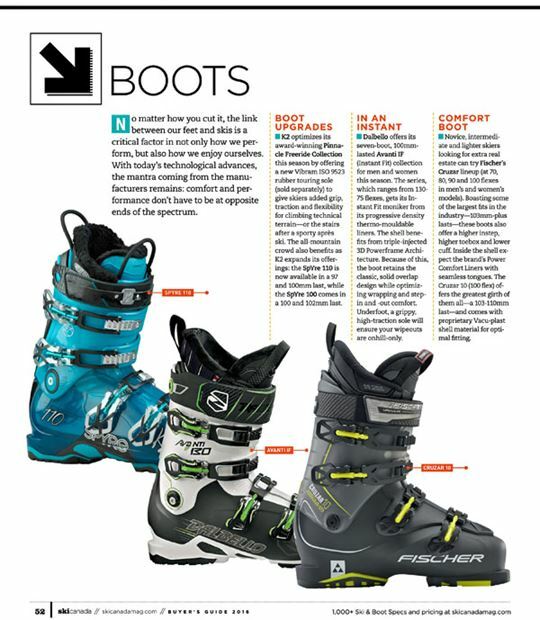 Full Tilt created its 102mm-lasted Descendant series in 8, 6 and 4 flexes to suit skiers with wider feet. Beyond the classic Full Tilt fit and shape, expect an easily adjustable three-position forward lean, 45-degree heel lock, asymmetric ribbed tongue for the smoothest flex and an optimized ladder cable buckle system. Every boot in the series comes standard with a heat-mouldable Intuition liner for a customizable fit. 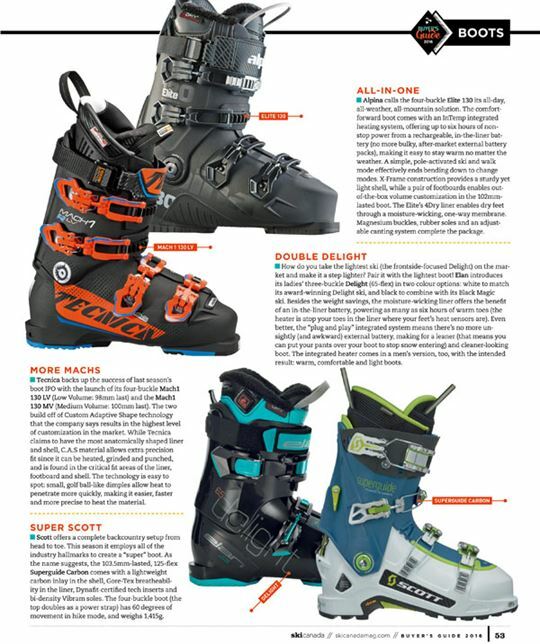 Atomic shows its commitment to the growing touring segment this season by launching the feature-rich, two-buckle, tech binding-ready Backland series. The low-volume (98mm) boot provides 74 degrees of natural movement via an ankle bushing with frictionless screw assembly and the easy-to-operate Free Lock 2.0 hike/ride mechanism, which also allows for forward-lean customization. Atomic builds the lineup from a feather-light Grilamid memory fit shell with a carbon spine and pairs it with a 20k/20k waterproof Ultralon washable liner. Both the liner and shell can be thermo-moulded to your foot. The releasable Quick Click Tongue and Skywalk rubber sole make for even better hikeability. At the top of the line, the Backland Carbon Light weighs in at only 1,161g. Scarpa drops weight while improving fit, comfort and warmth in its 101mm-lasted, race-inspired, overlap-style Freedom line. At the top of the five-boot series, the four-buckle, 130-flex Freedom RS incorporates the series’ benchmarks. Look for patented Carbon Core Technology in the lower boot for improved power transmission and the added benefit of super-sturdy, swappable soles (DIN and tech). The Ride Power Block, a frictionless ski/walk mode with 25 degrees of motion, offers first-class downhill performance, while a thermo-mouldable liner results in superior comfort and control. The Freedom RS 130 weighs in at 1,980g per boot. Those preferring softer rides can try its four-buckle Freedom SL 120 flex and the redesigned three-buckle Freedom 110 flex. Both come in men’s and women’s. 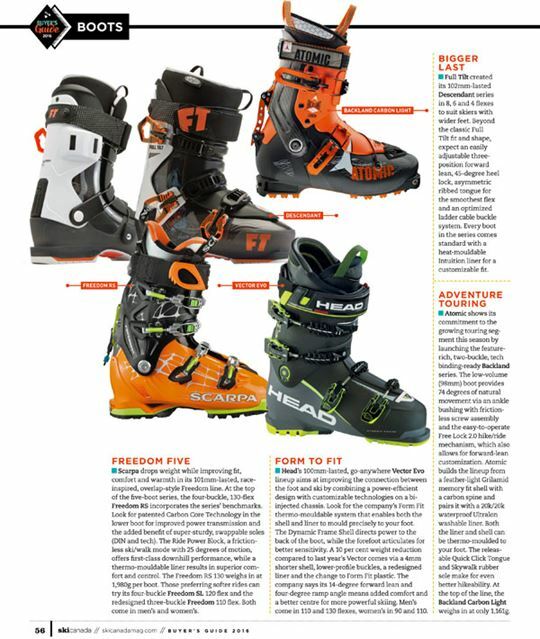 Head’s 100mm-lasted, go-anywhere Vector Evo lineup aims at improving the connection between the foot and ski by combining a power-efficient design with customizable technologies on a bi-injected chassis. Look for the company’s Form Fit thermo-mouldable system that enables both the shell and liner to mould precisely to your foot. The Dynamic Frame Shell directs power to the back of the boot, while the forefoot articulates for better sensitivity. A 10 per cent weight reduction compared to last year’s Vector comes via a 4mm shorter shell, lower-profile buckles, a redesigned liner and the change to Form Fit plastic. The company says its 14-degree forward lean and four-degree ramp angle means added comfort and a better centre for more powerful skiing. Men’s come in 110 and 130 flexes, women’s in 90 and 110. Fischer unveiled its new Power Fit liner, featuring a 100 per cent seamless and pressure-reducing tongue construction, a larger toebox and increased insulation. Look for it in Fischer’s RC4 140 Vacuum Full Fit, RC4 130 Vacuum Full Fit, the RC4 110 Vacuum Full Fit, Ranger Pro 13 Vacuum Full Fit and Trinity 110 Vacuum Full Fit. Meanwhile, the company’s well-received, four-buckle freeriding lineup saw a stiffening of the Ranger 12 and the introduction of the Ranger 11 Vacuum CF. 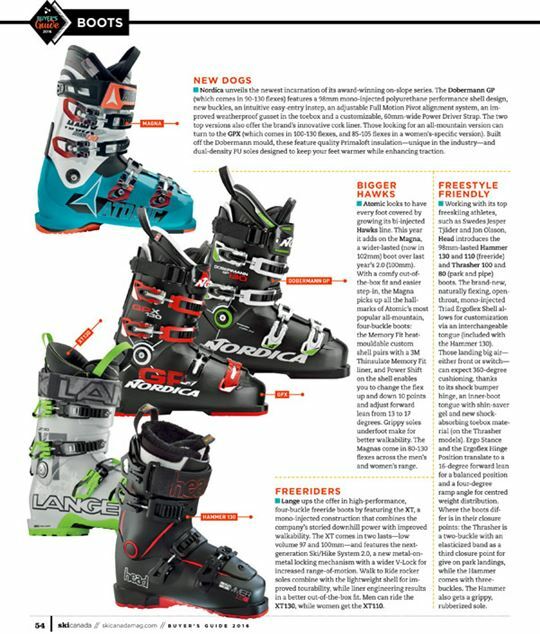 Rossignol inaugurates its AllSpeed (for men) and Pure (for women) lineup. The all-mountain-centric, mono-injected range comes in three lasts (102, 100 and 98mm), and features a flex adjustment (via a hex wrench) and canting compatibility for optimized fit and stance (the range comes in 70-130 flexes before adjustment). The Custom OptiSensor liners result in customizable comfort and warmth (women are warmed by merino wool; men get Thinsulate), while the Sensor Blade cuff’s anatomical design reduces weight and improves driving power and feel. Bought separately, interchangeable soles—both alpine DIN and rockered Walk to Ride (WTR) can be used in these models—increase all Pure and AllSpeed models’ versatility. Apex brings its new MC•X big-mountain performer to the market. While building off the company’s revolutionary two-part boot system, complete with open-chassis exoskeleton and a walkable, heat-mouldable inner boot warmed by Thinsulate, comfort remains paramount. Instead of focusing entirely on buckles, look for Apex’s two Boa closure zones, making for 18 points of contact. An external tongue construction sheds water, while the Vibram IceTrek outsole gives grip in icy conditions. On the open chassis, an adjustable flex arm offers multiple forward-lean positions and the possibility to tailor boot stiffness from 105 to 125 flex indexes.